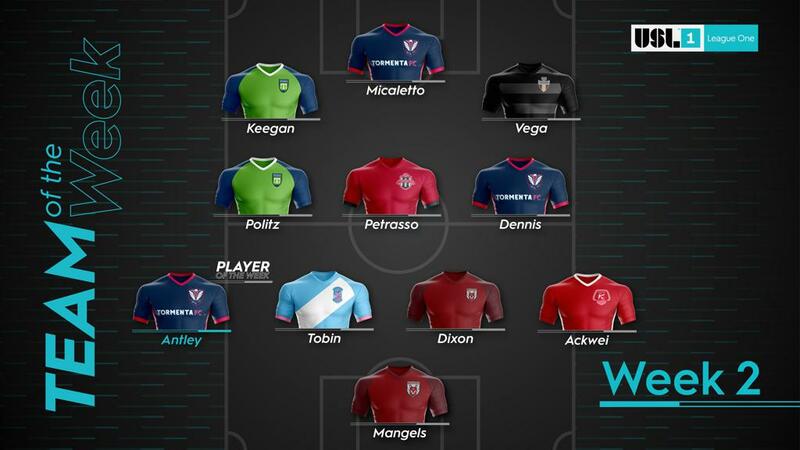 TAMPA, Fla. – South Georgia Tormenta FC defender Conner Antley has been named the USL League One Player of the Week for Week 2 of the league’s inaugural 2019 season. Antley recorded a three-assist game for Tormenta FC as it rallied to a 3-1 victory against FC Tucson last Wednesday night to continue its undefeated start to the season, and had a solid week overall defensively as he helped South Georgia record its second shutout of the season on Saturday night against the Richmond Kickers. GK – Alex Mangels, Chattanooga Red Wolves SC: Mangels posted a four-save shutout in the Red Wolves’ 1-0 victory against Forward Madison FC on Saturday night. D – Conner Antley, South Georgia Tormenta FC: Antley recorded assists on all three goals in Tormenta FC’s midweek win against FC Tucson, and over a two-game week won 16 of 23 duels and made 12 recoveries and six interceptions. D – Connor Tobin, Forward Madison FC: Tobin posted 11 clearances, went 3 of 3 in duels and completed 78 of 90 passes overall to anchor a solid backline display by the Flamingos. D – Richard Dixon, Chattanooga Red Wolves SC: Dixon helped the Red Wolves record their first shutout as he made six clearances, won 8 of 13 duels and had two interceptions against Madison. D – Wahab Ackwei, Richmond Kickers: Ackwei led the Kickers defense with four interceptions and also notched six clearances and completed 66 of 76 passes in Richmond’s shutout against South Georgia. M – Kevin Politz, Greenville Triumph SC: Politz scored the late game-winning goal to give Greenville its first victory in club history while also completing 38 of 47 passes and winning 6 of 9 duels. M – Luca Petrasso, Toronto FC II: Petrasso notched the game-winning goal with a sharply-taken volley and completed 12 of 14 passes to help TFC II defeat Orlando in its season-opener. M – Charlie Dennis, South Georgia Tormenta FC: Over two outings, Dennis recorded 20 possession recoveries, won 14 of 21 duels and almost provided the go-ahead goal with a free kick that was tipped onto the crossbar against Richmond on Saturday. F – Jake Keegan, Greenville Triumph SC: Keegan scored the first goal in Triumph SC history and completed 21 of 22 passes in the club’s victory on Saturday night against Lansing. F – Marco Micaletto, South Georgia Tormenta FC: Micaletto scored the insurance goal for Tormenta FC against FC Tucson on Wednesday, and for the week completed 35 of 41 passes and had 10 recoveries. F – Devin Vega, FC Tucson: Vega scored the opening goal, notched three key passes and completed 22 of 29 passes overall in Tucson’s visit to South Georgia Tormenta FC last Wednesday night.